Immediately after the end of the First World War, there was a short-lived boom in the economy, which lasted until late in 1919, but things rapidly changed. The early 1920s were a time of recession, a time of hardship for many people. The First World War greatly stretched the nation’s finances. It disrupted our trade, and led to the rise of foreign competition, and the loss of many of our traditional exports, including steel, coal, and textiles. The country had previously grown wealthy because of its pre-eminent trading position in the world, the loss of which, led to the decline of many of our once great industries, and substantial job losses. In 1922 there were 9,457 people out of work in Walsall alone. The war had been funded by selling foreign assets, and borrowing large sums of money, which led to a large national debt. Britain’s interest payments amounted to around forty percent of the national budget. In 1920 the rate of inflation was twice as high as in 1914, and the value of the pound fell. 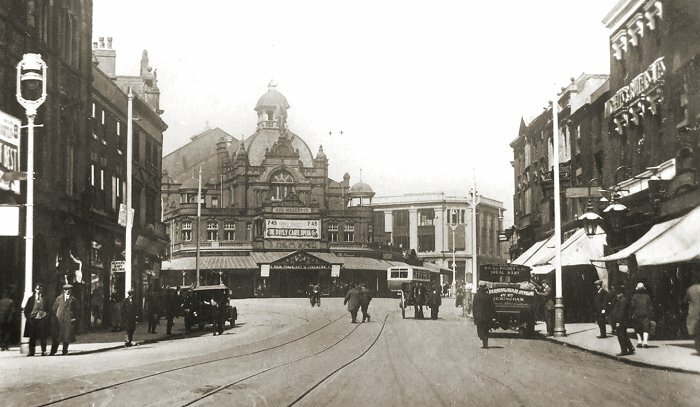 Park Street in around 1925. From an old postcard. 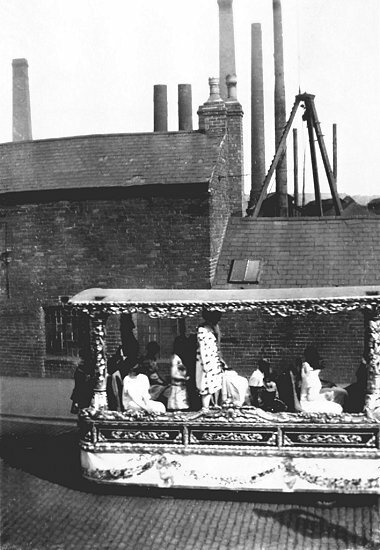 A carnival float in Pleck Road in the 1920s. Courtesy of Christine and John Ashmore. 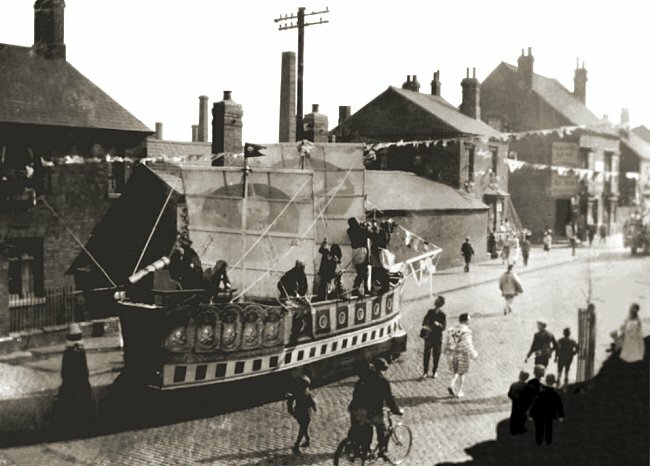 Another carnival float in Pleck Road in the 1920s. Courtesy of Christine and John Ashmore. By 1921 the population of Walsall had reached 169,406. This led to a desperate housing shortage, made worse because no houses had been built in the borough since before the war. Private builders could not afford to provide the necessary homes, which immediately after the war were costing between £1,000 and £1,200 to build. Ironically this sum fell to a little over £300 within ten years. The housing shortage was a national problem and so the Government provided subsidies for local authorities, who were now required to provide housing under the terms of the 1919 Housing Act. Walsall Council started its municipal housing scheme in 1920 under the control of the Health Committee, but as demands grew, a special Housing Committee was appointed. The first council houses were built in Blakenall Lane and Haskell Street in 1920, the first to be completed being numbers 94 and 96 Blakenall Lane, now opposite Blakenall United Reformed Church. By 1927 a total of 450 houses had been built on the Blakenall estate. In 1935 the charge on the general rates for council houses was £23,675, with a capital cost of £2,093,209, and weekly rents amounting to £2,500. In March of that year the 5,000th council house was completed at 11 Walstead Road West, and by the end of the 1930s 7,963 council houses had been built. Some of the houses were built as a result of the 1930 Housing Act which encouraged mass slum clearance, and the removal of poor quality housing. Houses were demolished in James Street and Ann Street in Ryecroft, and in Short Acre Street, and Long Acre Street. This was followed by the clearance of slums in Peal Street, Dudley Street, Lower Rushall Street, and Upper Rushall Street. In 1937 many of the old buildings in Digbeth were demolished, and new council houses were provided for the occupants, in Field Road, Fullbrook, Mill Lane, and Moat Road. By the mid 1920s many industries were still suffering, particularly after the decision in 1925 keep Britain in the Gold Standard, so that the pound was equal to 4.85 dollars. This led to high interest rates, and over-priced exports. One of the country’s most important industries, coal mining, had been in decline since the start of the First World War, and many miners were laid-off. The heavy use of coal during the war led to the depletion of many seams, so that when the war ended, Britain exported less coal, allowing other countries including the United States, Germany, and Poland, to fill the gap. In 1924 coal prices fell because of the Dawes Plan, which had been designed to set targets for German reparation payments. As part of the payment, Germany was allowed to export coal to France and Italy, which led to a further decline in the UK mining industry. In 1926, mine owners announced their intention to further reduce miner’s pay, and lengthen their working day. Negotiations between the TUC and the mine owners, failed to reach an agreement, and so the TUC called a general strike to support the miners, which was to begin on 3rd May. 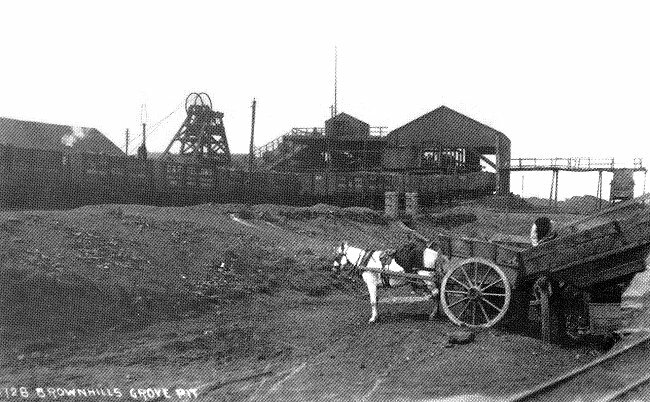 One of Walsall's deep coal mines, Grove Pit at Brownhills. From an old postcard. Large numbers of people from all industries joined the strike, which quickly paralysed much of the country. In Walsall there was no public transport because trains, trams, and buses were out of action. Hundreds of strikers filled the town centre, and strike bulletins were posted outside the Labour Club in Bradford Street. An emergency committee was formed to oversee the distribution of essential supplies, and around 1,000 people signed-up as volunteers to help. Three hundred and fifty special constables were sworn-in to be ready in case of lawlessness, but it all went-off peacefully, with little violence. The strike ended on 12th May, although the miners battled-on until November, when their strike collapsed. The strike led to lack of orders, and a depression in many local industries. 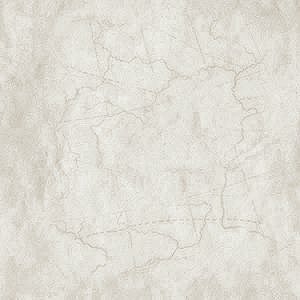 Around 2,300 workers were laid-off, including 500 in the leather trades. Some less fortunate strikers were not given their jobs back on their return to work, particularly in public transport. People laid-off were entitled to benefit from the Poor Law Guardians, and further help was provided by a distress fund. The Turf Tavern, Bloxwich; Field Street School, Bloxwich; the Blue Pig Inn, Bloxwich; Blakenall Church School; the Nag’s Head, Little Bloxwich; the White Horse Inn, Green Lane; and John Street School. Committees were set up in Aldridge and Pelsall to help, and hundreds of people scoured Bentley Common, and the old spoil heaps around Pleck to find coal for heating. Although many of Walsall’s industries had suffered as a result of the strike, and unemployment was high, things slowly improved, albeit briefly. 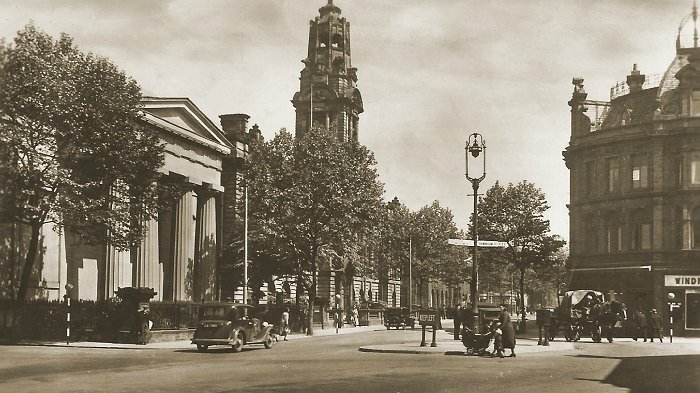 The top of Park Street in the 1930s. From an old postcard. By the late 1920s, the United Kingdom had still not recovered from the effects of the First World War. Production was still below previous levels, and many people were out of work. Everything suddenly got worse after 1929 as a result of the stock market crash in New York which affected much of the world. The demand for British products fell, so much so that by the end of 1930 unemployment more than doubled, from one million to two and a half million, and exports halved. The unemployed had to seek financial help from the Public Assistance Committee which means-tested applicants before allowing them to receive benefit. In order to help families in distress, Walsall Council introduced a scheme to provide two-course midday meals for needy schoolchildren. By February 1934, free meals were being provided for 500 children, six days a week. Things didn’t really improve until the years immediately before the Second World War, when industry began to ramp-up, thanks to the orders that were received for essential war work. Lichfield Street and the Town Hall. From an old postcard, courtesy of Christine and John Ashmore. Walsall Council attempted to help the many people who were out of work by instigating public works schemes for the unemployed. The schemes included the building of the open air swimming pool at Bloxwich, the levelling of Blakenall playing fields, and improvements to the Arboretum, including the upgrading of the open-air baths, an extension to the children’s playground, a putting green, new footpaths, and more tennis courts. The Rock Gardens were added in 1924 along with tubular swings, and a merry-go-round. 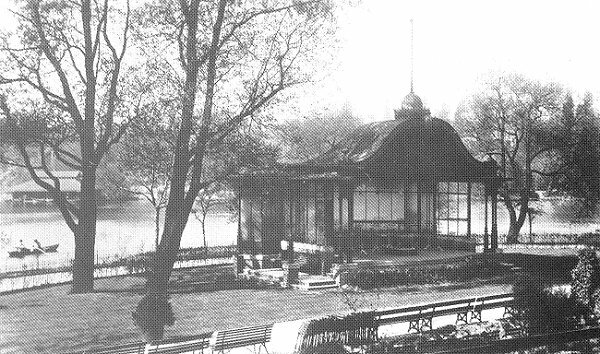 The bandstand in the arboretum in the late 1920s. A number of road improvements were also carried out to help the unemployed. The most important was the building of the new road from Foden Road to Bescot Road, which was originally called the Ring Road. In 1931 when the borough was extended, with the addition of an area to the north and west, including part of Bentley, the road name was changed to Broadway. 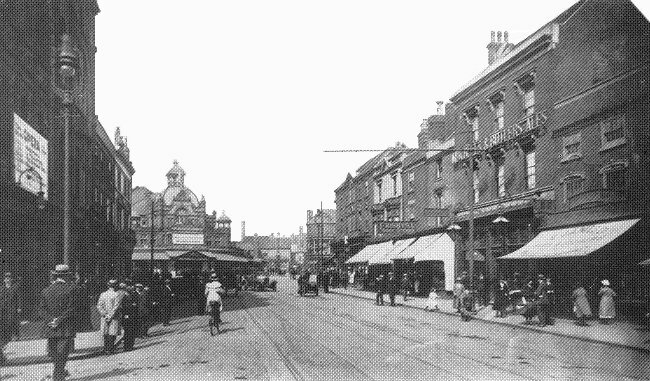 Several roads were widened including Lichfield Road in Bloxwich, Aldridge Road, Bloxwich Road, Bridge Street, and Sutton Road. In 1930 the council decided to spend £224,000 on public works, including a new swimming baths, an abattoir and cold storage facilities, an extension to Ryecroft Cemetery, and improvements to sewage, drainage, and public parks. By 1931 the population of Walsall had grown to 181,114, and 30 percent of the workforce was unemployed. In the 1930s two branches of the Wyrley and Essington Canal closed, due to the declining mining industry. The first, the Lord Hay's Branch (also spelled Lords Hayes Branch), was abandoned in 1930. It ran from Fishley to the Lords Hayes coal pits in Essington. The second, the Daw End branch ceased to be used in the late 1930s. It ran from Catshill Junction, Walsall Wood, to the Hay Head limestone quarries. In 1954 both were filled-in . On the railways, North Walsall Station built by the Wolverhampton and Walsall Railway in 1872, and operated by the Midland Railway from 1876, closed in 1925. It stood just to the west of Bloxwich Road. In 1928 motor buses began to replace the trams, which ceased running in 1933. Trolley buses were introduced in 1931 on the Willenhall route, and the central bus station, on the site of the former Blue Coat School in St. Paul's Street, opened in 1935. It was built after the Bluecoat School moved to Springhill Road in 1933. The same year saw the opening of Walsall Municipal Aerodrome on 230 acres of land beside Aldridge Road, south of Aldridge. It had a short runway just 900 yards long, much too short for the larger aircraft of the day. It also had a considerable slope, being situated on the side of Beacon Hill, the highest ground in the area. The official opening took place on 6th July, 1935. In 1938, Helliwells Limited, a firm specialising in the repair and maintenance of aircraft, and the manufacture of aircraft components leased a large factory on the site from the Corporation. They opened a flying school in 1943, and also manufactured motorcycle sidecars, motor scooters, and sports cars using the 'Swallow' name. The aerodrome became the headquarters of the South Staffordshire Aero Club (previously known as Walsall Aeroplane Club) which had 50 flying members and 100 non-flying members. A club house with a bar and small office was built on the site, along with a hangar, large enough to house four or five small aircraft. The council employed an aerodrome manager, who also acted as a ground engineer. A number of events were held at the aerodrome including a sailplaning display featuring gliders that were towed into the air by powered aircraft, or a winch. 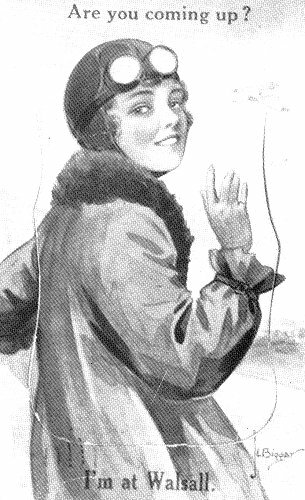 The event took place on 26th June, 1938 and starred the well-known female aviator, Amy Johnson, who made two fights, one in a Kirby Kite glider, and another in a Gull sailplane. The event attracted about 6,000 paying spectators, many of whom came to see Amy. On her second flight as she returned to land, she caught a wing tip on the perimeter fence, which caused the glider to flip over. Luckily she was unhurt, although somewhat shaken. She quickly returned to the house of her friend, John V. Rushton (known as Jack) at 134 Mount Road, Penn, Wolverhampton, where she was staying. Jack Rushton was the chief instructor at the Midland Gliding Club. The aerodrome was the scene of another crash landing a few weeks later. On 14th July an RAF Harrow twin-engined bomber on a flight from Driffield to Southampton attempted to land on the runway, which was far too short for an aircraft of that size. It overshot the runway and came to rest in a hedge, just off Longwood Lane. Luckily the pilot, a local man, Pilot Officer R. N. Haynes was unhurt. Unfortunately he was killed three months later in an identical aircraft which came down in the Channel. The Aero Club survived until the beginning of the Second World War, and was not revived afterwards. In the late 1940s Walsall Council considered enlarging the airfield and extending the runway, but as Birmingham and Wolverhampton were extending their airfields, it was felt that such a project could not be viable. In the 1950s the airfield was mainly used by Helliwells for aircraft servicing, the production of aircraft components, and for the flying school. The firm had an extensive machine shop and tool room, detail shops, and a good assembly area. Components produced for the aircraft industry included bomb doors, engine cowls, and even complete wings. One of the firm's largest customers was the R.A.F. In 1956 the company decided to transfer their operation to Elmdon because the airfield at Walsall had become too expensive to run. Work on the last aircraft to be serviced there, a Harvard, had been completed in the summer. On 8th October, 1956 Helliwells cancelled their lease, and the airfield closed.